Is it possible for one to tire of Mexican food? I think not. Whether it’s Mexican Lasagna, Peanut Butter Mole or a Taco Smoothie (recipe TBD), the possibilities are endless. This was a spur-of-the-moment recipe that ended up surprising me and the others who partook in its glory. This has since become a staple meal as it’s a simple and tasty way to get fish into your diet. To all my peanut butter lovers out there, I promise the next thing on this site will contain peanut butter. 1. Preheat oven to 400 degrees. Spray a baking pan and place salmon on top. Sprinkle with salt and pepper and bake for 10-15 minutes (depending on thickness) until cooked through but still moist and flaky. While it’s baking prepare the honey mustard sauce by mixing together the sour cream, honey mustard and salt and pepper, to taste, in a small bowl. 2. Also while the salmon is cooking, cover another baking pan with tinfoil, spray with cooking spray and arrange tortillas on top. Spray the tops with cooking spray and add a pinch of salt to each one. Bake tortillas for 4 minutes, then flip them over and sprinkle with cheese, if using. Cook 3 more minutes. 3. Flake the salmon with a fork and place on the tortillas. Top with honey mustard sauce, shredded cabbage or lettuce, guacamole and cilantro. Serve with a side of boiled or refried beans. I can vouch for how delicious these are. Nick made them for me when he was in California but cooked the salmon and tortillas on the grill. A very memorable meal. Ah yes, greek yogurt is a great replacement for the sour cream. The only gripe I have with greek yogurt is that it has the natural sourness of yogurt, whereas sour cream has a much smoother flavor. That being said, I use the same recipe for honey mustard salad dressing by simply switching greek yogurt for the sour cream because I like the sourness in that case. Oooh I like the sounds of that. I think salmon in ANYTHING is good! The recipe sounds good but I would have to taste it since I am not a big salmon lover. I can eat it once in a while but can’t afford the price of it in the grocery store to eat it more often. Well there’s a good solution to that. Buy the frozen kind – I purchased a bag (same brand on the east and west coast of America) containing 2.5lbs of salmon filets for around $12. Each individually wrapped filet was very thin and perfect for about 8 tacos. 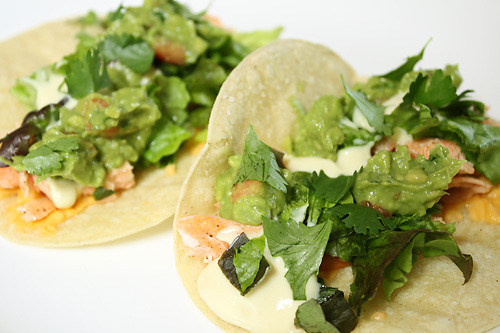 These tacos are also great with cheaper fish, like tilapia. no one can ever get tired of fine Mexican cuisine. great looking fish taco. This sounds great. I have some salmon at home and I’m gonna try this tonight! Yum! Hello! I’m a current Senior at Vanderbilt University and I’m working on a project to improve peanut butter jars. I have enjoyed reading your blog and share your love for peanut butter! I always have a hard time scooping out all of the peanut butter and we wanted to see if people like you would be interested in this type of jar. Do you ever find it difficult to scoop out peanut butter from the bottom of the jar? Would you potentially be interested in a jar with a lever (think of a push pop) that lets you scoop out all its contents?